He ruled North Korea with an iron fist, starved his own people and kept the world perpetually on edge with his nuclear threats. But whether it was on the golf course, the bowling alley or the finest fashion runways of New York and Paris, the diminutive North Korean leader was constantly proving his global superiority. 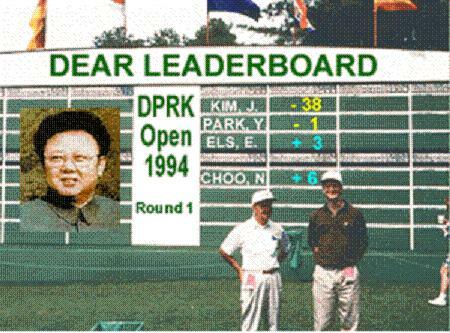 In 1994, North Korean state-run media reported that as he celebrated his 62nd birthday, he took his first golf outing ever to an 18-hole course near Pyongyang. He finished with an incredible score of 34—a full 38 strokes under par, scoring 5 holes-in-one, a fact verified by his 17 body guards who were all reportedly there to greet and hail him as the Supreme Leader wrapped up his remarkable round on the 18th hole. He was also the world’s greatest bowler with witnesses reporting he completed a perfect score of 300 in his very first visit to the lanes. None of which should come as a surprise coming from a man who, according to official North Korean state literature, was born in a small log cabin in 1942 near Mount Paekdu, the nation’s most sacred mountain. The birth, which had been predicted by a swallow, caused a bright star to appear that immediately changed the seasons from winter to spring followed by an amazing double rainbow. North Korean newspapers also reported that he was one of the world’s leading fashion figures; that his khaki pant suits were being emulated around the globe. State media also pointed out that his birthday was celebrated around the planet and that many, many nations held festivals in his honor. Supreme Leader did not allow foreign fast-food restaurants in North Korea and he didn’t need to as he invented a sandwich called “double-bread with meat” and had a special facility built to make it by the thousands for his starving people. There will now be 11 days of mourning for Dear Leader in North Korea. Apparently out of respect for the fallen dictator, there has been universal silence from the international golfing, bowling, fashion and fast-food communities since the emotional announcement of his passing late last night. This chain-smoking, brandy-guzzling golfing great — whose hundreds of titles included “The Eternal Bosom of Hot Love” — keeled over while inspecting fields from his lavishly equipped train — which had live lobsters airlifted to it daily. Perhaps I should adapt my practice regime accordingly for any chance of securing those elusive hole in ones.